When Nairo Quintana got his first bicycle at 15, he did not think of becoming a professional cyclist and finishing second in the prestigious Tour de France. The peasant’s son was just trying to save money on bus fare. The adulation and attention the Colombian has experienced throughout the tour’s closing stages, are as distant to Quintana’s upbringing as one could imagine. The son of two peasants, Quintana was raised in difficult economic conditions. At age 15, the economic hardships of his family led his father, Luis, to buy him a $30 bicycle as he did not have the money to send his son to school by bus. What was intended as a way of saving money, however, has turned into a glorious career. After having received the bike, the young Quintana would cycle the 18-mile round trip to school every day, daydreaming of racing. “I imagined I was in a race and always tried to win,” he told newspaper El Tiempo in a 2010 interview. Even after joining his first team, Quintana’s family could not afford his race fees. According to website Cycling Inquisition, his father would convince race organizers that fees would be paid after his son had won the race. A scheme which allegedly worked frequently and allowed the peasant’s son to race with others. 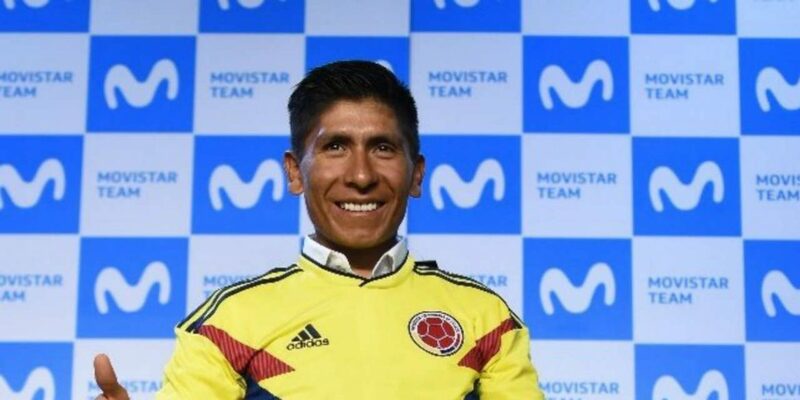 Four years after getting his first bicycle, Quintana signed his first professional contract in 2009 when he joined Boyaca Es Para Vivirla, the local team sponsored by his department’s government. From then on, his career began to accelerate. Less than a year later, Quintana won the Tour de L’Avenir in France and was hailed by President Juan Manuel Santos as a national hero. Consequently, the rider was signed by Team Movistar. Further success followed as Quintana won the Vuelta a Murcia in 2012 and the Tour of Basque Country in early 2013. Notwithstanding, world-wide attention did not arrive until halfway through 2013’s Tour de France, when Quintana rode to the top 10 of the general classification, especially after putting on the white jersey for being the best rider under 25. As if that wasn’t enough of an accomplishment, Quintana accelerated and rose in the standings in the mountain classification. The day before the end of the tour, the Colombian surprised friends and foes by sprinting away from the pack at the front of the race, winning the stage and securing both the polka-dot jersey and second place in the general classification. In 2014 Quintana won his first classic tour race, sealing a sensational victory in the Giro d’Italia, coming from 3 minutes and 29 seconds behind to win with a 3 minute lead over his rivals. In 2016 Quintana’s rivalry with Froome failed to live up to the previous year’s expectations and the Colombian rider finished 3rd in the general classification of the Tour de France after suffering from allergies throughout much of the tour. So far in 2017 Quintana has already won the Tirreno-Adriatico race in Italy and has announced that he will be skipping the Vuelta d’España to focus on the 2017 Tour de France, with his eyes firmly set on winning his first yellow jersey. Quintana’s family, however, have remained as humble as ever and continue to have trouble making ends meet, especially after father Luis fell ill and found himself paying hospital bills the family didn’t have the money for.